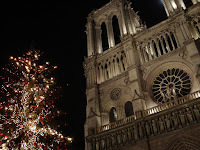 Christmas Eve this year was certainly a little different to the usual, being spent at Notre Dame cathedral in Paris. It was a wonderful evening, cold, but clear and still. Being at one of the most famous churches in the world seemed like an excellent way to see in Christmas Day. The exterior was well lit with beautiful lighting, and the interior was filled with fantastic choir singing and all the pomp and ceremony of a catholic service. I was surprised by Elodie’s very negative reaction to her first ever church sermon which, being in French, I didn’t get a word of. Apparently plenty of sin and damnation, with a sprinkling of hell fire and repentance. Certainly no majority of time spent on love for one another, personal self sacrifice, or even world peace. Pity really. Sawing up bits of wood and banging in nails has always been part of the male physic, and so when offered the chance to try my hand at building a shed for some friends I jumped at the opportunity. Rosie and Steve have recently moved down to Te Anau and purchased a piece of land at Patience Bay. 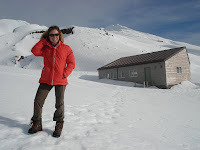 It is a great spot with spectacular views of the lake, the Murchison and Kepler mountains and of course the snow covered Darrens. Along with cutting of weeds, planting of natives, and clearing of waterways, building a shed on the section was on the to do list. The actual design was a moving target, with about the only fixed requirement being 10 square meters to avoid a building consent. I enjoyed surfing the web, making various sketches on the backs of envelopes, and visiting a nearby building site to sort out how to put it all together. With no power on site we only had a hand saw and hammer, along with a tape measure and level to keep us going in the right direction. Elodie, my french friend from Paris came to check out New Zealand for three weeks, and so a whirlwind tour of the country was in order. We did pretty well I think getting in some great sights and scenery from both the north and south islands. The highlights included visiting Auckland Museum for some background, then Mt Ruapehu for some snow, checking out the geothermal fields of Rotorua, swimming at the beach and cycling the port hills of Christchurch, staying the night at Aspiring Hut in the Matukituki Valley, nordic skiing at the snow farm, getting extremely wind blown on the three day Kepler Track, and seeing the Darrens and Milford Sound in spectacular sunshine.